We no longer have a valid email address for Lori. I’m looking for the Carter’s Child of Mine Bunny Hugs Yellow Rabbit. I saw that someone else was looking for it also, and then I scrolled down and said it was found. I would love to find a backup for my 3 year old. It’s his absolute favorite, and I’m scared to think what will happen when “Baxter” has fallen completely apart! 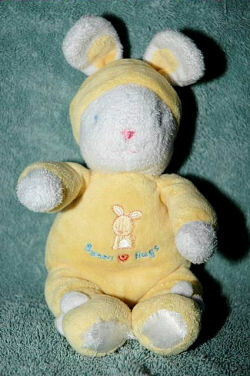 If you can help Lori find this Carter’s YELLOW Bunny Hugs Rabbit, THIS SITE IS NO LONGER ACTIVELY MANAGED. Please use Our FREE FACEBOOK GROUP, including #040308-1 in the subject, . Thanks, Tami. I emailed them. Did you ever buy the one tami found? If not and still looking, I have one brand new with tags. 8 inches tall not counting ears. No, we never did get a replacement. Is yours exactly like the one in our picture? Can you email us directly at callove@charter.net for further details? Thanks! Check you email, I sent you the pictures. I no longer have a valid email address for her. Sorry.